China’s positive economic outlook, supported by growing GDP, has been contributing to the growth of the meat sector in the country, which is expected to grow at a compound annual growth rate (CAGR) of 2.8% from CNY1,387.7bn (US$209.9bn) in 2018 to CNY1,589.9bn (US$247.6bn) by 2023, says GlobalData, a leading data and analytics company. 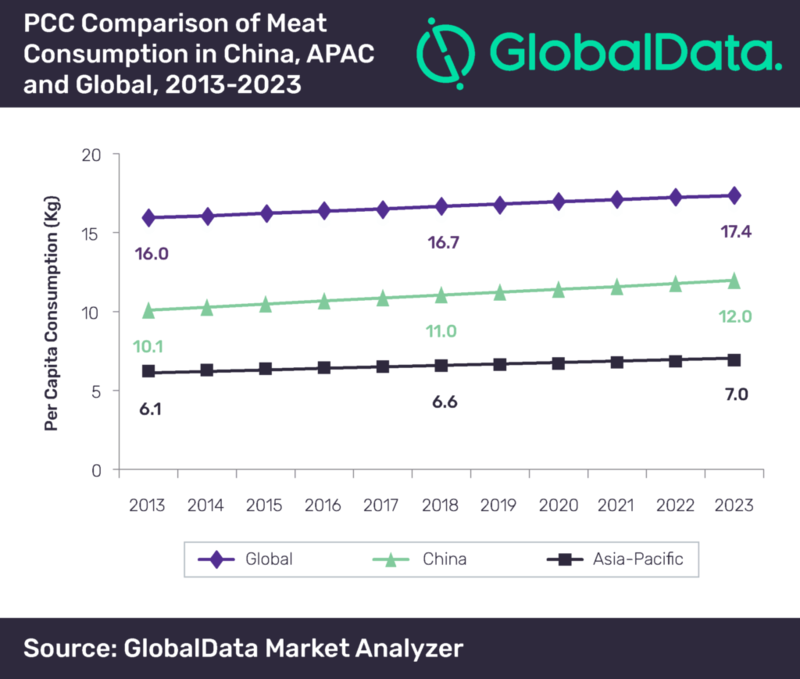 GlobalData’s report, ‘Country Profile: Meat in China’, reveals that fresh meat available in retail counters held the largest value share of 79.1% in 2018 and is forecast to grow at the fastest value CAGR of 2.8% over 2018-2023. This was followed by chilled raw packaged meat – whole cuts with a value share of 8.1% in 2018. The category is expected to record a value CAGR of 2.7% during the forecast period. The report further points out that China dominated the APAC region with a significant value share of 72.9% in 2018. The country’s value share is expected to decline to 72% by 2023, mainly because of faster growth of meat products in other leading countries in the region such as Hong Kong and India. The per capita consumption of meat in China, which was 11kg in 2018, is forecast to increase to 12kg by 2023 – values which are higher than APAC levels but below global levels. WH Group, Inner Mongolia Praire Xingfa Co., Ltd., and Beijing Ershang Dahongmen Meat Foods Co., Ltd. were the leading players in the Chinese meat market; while Shuanghui, Grassland Xingfa, and Dahongmen were the top brands. A well-developed distribution network of hypermarkets and supermarkets, and consumers’ positive perception of private label products, have contributed towards the large consumption of private label meat products, which accounted for an overall penetration level of 33.7% in 2018.